It’s my Outstanding Acting Bulletin. Each month I produce a proper ‘made of paper’ acting news bulletin, that I will send directly to your snail mail address. From the comfort of your own home you can read and learn from me, via the bulletin. 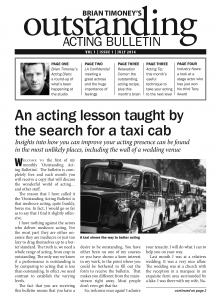 In it, I will be giving tips and advice on acting and the acting industry all FREE! All you have to do is sign up on this page and you will get the next bulletin when I issue it. Sign Up And Get Your Free Copy! Fill in your details below to receive your free report.